Update 1/20/13 4:11 p.m. ET: Apple has pushed U.S. shipping dates for the Mac Pro back to an unspecified date in March as well. Check out the photo below, courtesy of Apple’s U.S. page. First, the new Mac Pro’s ship date was set for December. Then, it was pushed back to an unspecified date in February. Now, it looks like much of the world won’t be getting their shiny, cylindrical Apple desktop until sometime in March. The new March ship date reportedly applies to Europe, Africa, the Middle East and Asia, according to MacRumors. For now, it looks as if US-based customers won’t have to wait any extra to receive their Mac Pros, with Apple’s US page still indicating a “February” ship date for the high-end desktop. This new Mac Pro shipping delay will no doubt annoy consumers who were eagerly awaiting the mysterious-looking desktop’s initial late-December arrival. An exact date for March Mac Pro shipments has not been revealed. 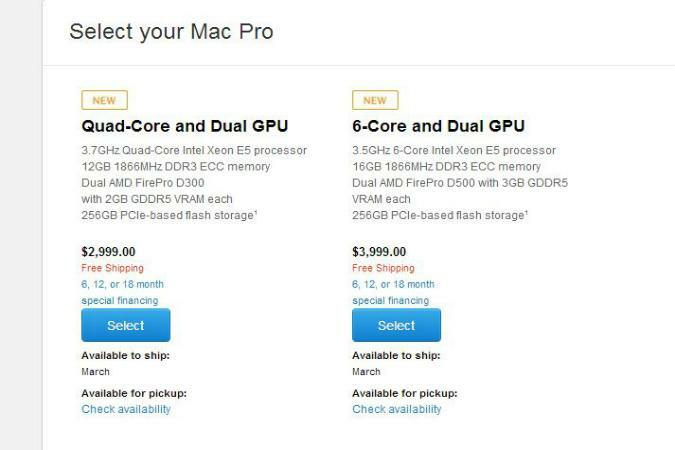 What do you think of this new Mac Pro shipping delay? Sound off in the comments below.